There are 4 parcel forwarders on Taobao. I have used 2 of them – 4PX and DPEX. DPEX is a new entrant to this business. I thought i could give them a try since they offer a slightly lower rate than 4PX. So how did they fare? 1. They quoted the weight of the items to a single decimal place, instead of 2 decimal places like 4PX does. For example, 0.5kg. Very obviously, they rounded the weight upwards. It is possible that for an item that is 0.41kg, they rounded it up to 0.5kg. You’re not at the scene when they take the weight measurement, so they can really just quote a random weight if they wanted to. I’m inclined to think that a weight measurement having 2 decimal places is more likely to be real. At least, it takes more imagination or creativity to fake a weight measurement of up to 2 decimal places every time. I’m more willing to pay for the extra “work” done of plucking 2 decimal places out of thin air than 1. But anyway, a 1 decimal place weight measurement doesn’t sit well with me, not when you’re billed in 0.5kg quantum. If you’re buying 5 items or more, and every item is rounded up to the nearest 0.1kg, you’re definitely going to be billed for an extra 0.5kg of shipping cost! 2. In the consolidated shipment package, some items came sans their original packaging material. That is a big NO! The stuff you bought from the respective Taobao sellers were sent in a packaging that the seller deemed necessary to protect the item throughout the course of their delivery. Some items can be damaged if shipped without their original protective packaging. Guess what happened to some of the packages when they reached DPEX warehouse? They opened up some of the packages in order to make everything fit into the box they chose for shipping my stuff! What if they have dishonest staff who decided to keep some of the items you bought, or if they were simply careless and left out some items? Nobody will claim responsibility! They should not allow such a possibility in the first place! Here’s the thing that is most repulsive about DPEX – when they ship stuff with the packaging material removed, they still charge you the shipping cost according to the weight which is inclusive of the packaging material! I purchased a camera bag that is listed as weighing 300gm on the product page but was quoted 0.5kg by DPEX. Guess how the camera bag was shipped? Yes, simply wrapped in a plastic bag! If i was billed the correct weight then maybe i wouldn’t mind the repackaging done. My experience with 4PX was far better. The items are all delivered in their original packaging, the weight is calculated up to 2 decimal places, and i also get an SMS on the day of the delivery (obviously DPEX didn’t do this)! Forget DPEX and go with 4PX! A lot has changed since i wrote this blog entry. The couriers have changed, and the shipping rates too (more favourable now). I have not shipped via Taobao Consolidated Shipping for a long time, but have used ezbuy and 86OF. Ezbuy for shipping small items, because they have the option of self-collection from warehouse, which totally avoids the hassle of failed deliveries. And they’re likely cheaper too for non-bulky items. 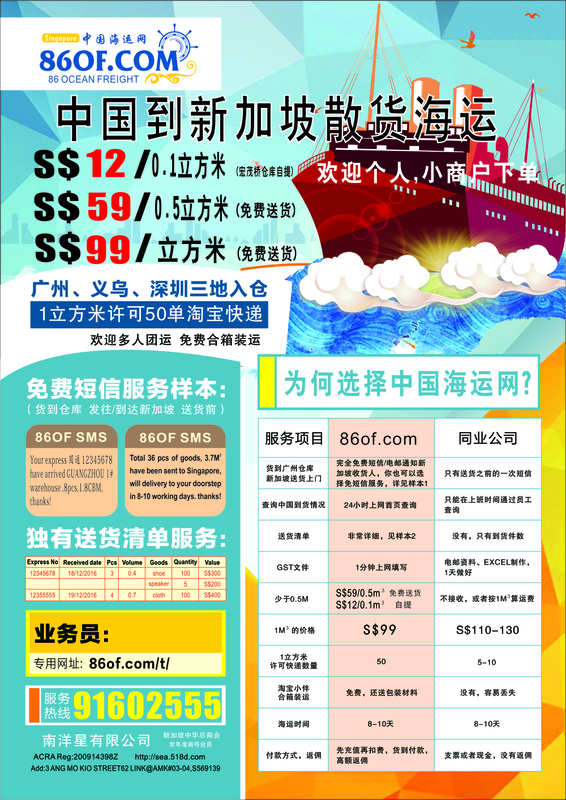 86OF because you can ship large items, which you cannot ship through Taobao nor ezbuy, and for a low price too. If you’re new to Taobao shipping, i would encourage you to try out all the options to see which one works best for you, though for large items, you don’t really have a choice. Oh no! I wish I had read your post before ordering my stuff! How do the shipping times compare? Was DPEX faster than 4PX or slower? They had more or less the same shipping duration, both about a week or so. I think your stuff will probably be fine. I had missing items but it was probably due to the seller (update: seller claimed 3 persons checked to ensure all items were packed, so it is quite possible that DPEX left out items when they did repackaging.. well it was not so much of repackaging but more like dumping items into another box). In any case, i don’t want to use DPEX anymore. Hi! Can i know if dpex will notify you after your orders reach their warehouse like 4px? Cos i didnt receive any messages and when i check taobao again, its states that it reach the warehouse and it got shipped out again?! And now my status is “booking arranged”..
For DPEX the arrival at warehouse will be indicated by the status message “您的包裹已被中通集运仓签收”. Not sure what you mean by “booking arranged”. Sometimes I get confused also when I see the status “签收” and afterwards the package is on the move again. It really hasn’t actually reached the warehouse until the message with the warehouse name appears in the status, whether for DPEX or 4PX. For 4PX, I get an SMS on the day of delivery in Singapore, but no notification at all for DPEX. In fact, for 4PX, even the online status is updated with an “out for delivery” message (包裹正在派送中), but for DPEX, the status is only updated with “proof of delivery” and “out for delivery” after delivery is completed, which is pretty much useless. In other words you won’t know beforehand they are coming at all. SIGH. i wish I read your review but I made my order thru this new DPEX instead of the usual 4PX 🙁 And I got lots of items, and if all is rounded up, I guess I’m gonna pay much extrassss for the shipping. Sorry to hear that.. I guess on paper the slightly lower shipping rate looks attractive but it’s just a ploy (cheapskate me fell for that.. not saying you’re cheapskate though ;)). Actually, I’d be very interested (maybe other people reading this blog entry also) to find out about what how your parcel delivery turns out. Hope it goes well..
Not to worry kel, if DPEX is always unreliable, you’ll be seeing many many more negative comments here ? Worst still.. now my parcel went missing! I arranged to have my parcel delivered last Friday and it was a no show. Now.. no one picking up the phone at the company. =( I am waiting to get the envelopes for my wedding invitation cards. Wow, that’s bad. They probably still have your parcel if they accepted your delivery request. Hope you get the parcel soon! And also, do you know the duration that they alow us to keep the stuff in the warehouse? For example, 4px gives us a 20 day grace period, what about DPEX? Hmm.. not too sure about what you mean by “second shipping”. Do you mean the payment for the consolidated shipping? If so, that would be an action you have to initiate yourself once you’ve confirmed that all your parcels have arrived at the parcel forwarder’s warehouse (e.g. DPEX’s warehouse). If my memory doesn’t fail me, I think the duration for consolidating the parcels is the same for both 4PX and DPEX (20 days). Anyway, the delivery in China is very quick (sometimes delivery is completed the next day after placing the order) so it’s nothing to worry about. I had a look at my taobao account and unfortunately they don’t keep records on the delivery status messages, but i somewhat remember that DPEX simply updated the status to delivered when they were out for delivery and before i actually received the package, so i think their status update is probably not reliable. Anyway, looking at the records you’ve shown, it is possible that when they start processing your consolidated shipment, it’s considered “in transit to destination”. Just a wild guess. What i learned from this is not to take their status updates too seriously.. the delivery man will just suddenly appear at your doorstep. If you use 淘宝直送 it will go to 中通ZTO and if your package dimension is over 80cm long or width it will be rejected by their warehouse. Be careful when ordering. I got a few items got rejected and I left only 1 item which they accepted. In the end have to contact them and request them to ship 1 item. Parcel size restriction on individual forwarder from taobao. If you are not sure how big your item is, contact seller for dimension 1st before you purchase. Thanks Jason for your insightful comments, didn’t know about the restrictions on the dimension! I guess it’s a good idea to get acquainted with doing sea freight shipment in the case of shipping very large or heavy items. I am going to do a sea freight shipment soon (the last time I did so was years ago), will definitely blog and share my experience. This is my second taobao purchase. First time I managed to use Taobao Global Direct which was really smooth and easy. Everything reached me within a week from order without the need for any consolidation or activation on my part. Fedex did the last leg of delivery (surprised)! Second purchase, I used mobile and somehow it didnt have the Taobao Global Direct option and I chose some “International” option and was asked to pick a forwarder upfront instead of Taobao Global Direct (so I chose ZTO). Now 2/3 of the orders are at ZTO, was thinking of ordering some more items to consolidate with this trip since I still need to wait for the 3rd parcel to send out and reach ZTO warehouse. But when I chose consolidated shipping while playing around the new order, there was no ZTO option – Only 4PX, DPEX, PRT and DEX. How come ah? Is it possible to add more to my ZTO account? Now reading your experience, I am also worried that the packers may open up my item and remove some things like accessories (1 of the item is electronic and quite pricey). It looks like taobao has reorganized their shipping consolidation quite a bit since my last order (which was just before this blog posting). From the shipping consolidation information page (http://world.taobao.com/markets/all/15s11/logistics?wh_area=singapore) it looks like ZTO and DPEX are grouped together as one option, so probably for your case you should choose DPEX. Anyway, based on what i recall, if you have already used a particular forwarder before, your warehouse address for that forwarder would be registered in your account and for future orders you simply need to choose to ship to that warehouse address rather than specifically choose the forwarder? Anyway, I think the shipment should be safe. Since Taobao global direct uses ZTO DPEX to do the shipping, I doubt they will let the delivery become so problematic as to become a hindrance to attracting future business. Guess you have a point. I have tried adding on orders and sending them via DPEX just to try out to see if it can be consolidated with my first purchase by ZTO. Will update when things arrive. One of the sellers has not send out the item after more than 72 hours despite reminders, it it normal? Hmm, one time i encountered the situation where the seller didn’t have stock (and won’t be having any additional stock), but I wasn’t informed until I initiated an instant message conversation with them. I guess it depends on the seller and the item, but normally Taobao sellers are super efficient. Hi is taobao global direct a lot better than taking orders from taobao agents? I’ve been looking for this kind of service since. Im from the UAE can you give me some tips? Hi, thanks for dropping by! I have not used the global direct shipping before myself, so I can’t say if it’s better, but it is definitely easier than using agents. The courier company that handles the delivery of global direct goods in Singapore is DPEX and I found them to be unreliable (I have also read similar complaints in forum postings), so I guess it really depends on who handles your delivery in UAE, whether they are reliable or not. If I were you, I would definitely give it a try, maybe ordering something inexpensive, just to see if works well. Cheers. Hello, how do i request them to remove shoe boxes ? Unfortunately there is no option for you to do this. They basically decide for themselves what they want to do at the time of packing the consolidated shipment. I would prefer the shoe boxes to be retained since the weight of the shoe boxes are included in calculating your shipping cost, even if they are removed. I have tried DPEX before twice. Yupp, they didn’t text me when all my items have reached their warehouse. But i thought that it was ok, cause i was checking my delivery almost everyday. Hahaha! But they did gave me a call when they reach my doorstep. No problem so far from them. All well packed. Quess their service varies. Now that you mention, yes, i actually get an SMS when each and every item arrives at 4PX’s warehouse, but i check my delivery status very often as well, so these SMSes are redundant indeed. What was actually useful was the SMS that tells me they were going to do the delivery to my home. DPEX must have impressed Taobao enough to be able to win the “Taobao Global Direct” business, so they can’t be that bad i guess. But they lost my business forever, heh. Seems like the other 2 competitors (PRT Express and DEX) have dropped their 1st kg shipping rate. Looks compelling enough for me to try them next time. I used DPEX for 11.11 shopping and the items reached their warehouse in Shenzhen a week ago. I paid the overseas shipping fee once all items are signed into the warehouse but until now there is no sign of them sending out the items. The status is still “The items are waiting to send out”. And I tried all their customer service hotlines but none is reachable. Some numbers are even expired! The online customer service gives no reply either. Gosh, this is the WORST experience ever!!! Do you know anyway to speak to their customer service or any number to call to? They’re probably overwhelmed by the surge in orders. Sorry but I have no idea about their customer service. I guess just hang in there, you’ll get your shipment. Don’t take the status too seriously, I don’t think it’s accurate. For all you know your parcels may be in Sg already. hi. may i ask if you still have the address of DPEX warehouse in Shenzhen? can you help me check in your logistic/shipping tracking since you used DPEX in you last transaction in taobao. because im having a problem rigth now. i just ordered in taobao and the sellers shipping agent just contacted me asking for the warehouse address because the seller gave him incomplete address. i try to contact the seller and DPEX but cannot contact. your response is very much appreciated. thank you. It seems like the address is actually not listed anywhere in the Taobao website. Ultimately i think the seller should be responsible for ensuring the shipment is completed properly, so i guess you should keep pestering the seller. It’s funny though that they actually managed to contact you rather than the seller. Just want to let people know that I am extremely disappointed with 4PX. First time user based on their lower consolidate rate….but I got my lesson. 1. Extremely slow delivery. I know that the packages are in HK for at least 2 days, and it took another 2 days to reach me. 2. Chose to deliver to the door (residential) no warning of extra charge at the time of picking that option. 2 days later, got sms saying extra HK$25 needs to pay out to the delivery guy. I asked why, they said delivery to a residential address might incur extra fee which was stated at the beginning. NO, that’s a lie. 3. The delivery guy called me on the day of delivery, asking me where to park his car?! How to get my building?! For god’s sake, I live in Kennedy Town. Seriously, I live on the Ground Floor. 4. So, out of helplessness, I called their CS, she said:”We don’t have the driver contact cell phone no.” So, they literally, cannot contact their driver…..
5. Finally, the delivery guy came, dragging my package on the floor, holding just a corner of the sag. At that point,I took the package from his hand, gave him the extra fee he demanded and just carried it back to my flat. I just want the nightmare to end. Sorry to hear about your bad experience. I guess the service level of the courier companies varies from country to country. In Singapore, Singapore Post is the local courier company handling the deliveries forwarded by 4PX in China, and i haven’t had a negative experience with Singapore Post yet. I think your comments are really helpful to fellow HK Taobao shoppers, thanks! I’m really nervous right now. 4px sent me an “out for delivery” SMS yesterday. But up til now there is no delivery guy arriving at my doorstop. Is this normal? Esp now during the Christmas season? Bc the sms did tell us to ensure somebody’s around to receive the items but they have not arrived even after more than 24 hours. That’s not normal. I’m afraid i’m of no help here, since i have no experience with non-delivery. Now that you mention, it occurs to me that i have no idea about how to get in touch with the customer service. I suggest you check your Taobao account (PC web browser) to see if there’s any status update. Anyway, i mostly have a good feeling about SingPost delivery (they handle the Singapore delivery for 4PX), so i think you don’t need to worry so much. Hi, I have tried using the taobao global direct but it seems that 1 of the item is not sent out by the seller but i need the other stuff urgently. would it be possible to ship out the rest of the items first? if yes, how? thank you!! In this case you need to speak to the seller directly. Hope you’re comfortable with using (and typing) Chinese? Just go to 已买到的宝贝 and click on 联络卖家 just above the ordered item. I have communicated with many of the sellers through the 阿里旺旺 online chat and i always get immediate response (in this aspect the customer service of the Chinese is really unbeatable). They are quite flexible too. If i have many different sellers does it mean that i need to talk to all of them to request to ship it? Because i dont quite get it as all the other items is in ZTO warehouse(?) already. Hmm, i get what you mean now. Actually, i have never used the global direct service, so i have no idea how it really works. My impression was that every item will just be shipped to SG without having to be consolidated, but from what you describe they actually consolidate before shipping. I guess you’ll need to remind the sellers to ship the items (there’s this option 提醒卖家发货 that you can click on). If they’re still not shipping, then you should speak with them. Hi, this is my first time buying from TaoBao and I’m using ZTO to deliver my items. May I know the estimated duration it’ll take to reach? Cause I need to items urgently, but my tracking progress shows that they’re still delivering it to be shipped. And I’m not even sure where it is now. Your help is appreciated, thanks! Hi Elaine, congratulations on making your first Taobao purchase! The items normally take 2 to 5 days to be shipped from the seller to the warehouse, after which it will take up to a week to ship to your doorstep. I’ve not done global direct shipping before, so I’m not sure how they update the delivery status, sorry about that. Great review, I have recently ordered through dpex, and got missing items too. But my experience with 4px previously were all quite good. The only time that delivery was delayed was because of SingPost. However, I just want to leave this comment to remind other readers, if you are buying stuff with big volume, the forwarders using air frieight would now count volumetric weight. If the goods you are buying has a higher volumetric weight than actual weight, they would charge you the volumetric weight. The formula for calculating volumetric weight is (length x width x depth) / 6000, for 4px (unit in cm). I learned my lesson last time when I ordered a carpet, the actual weight was only 3kg+, but the volumetric weight was over 13kg! TOT so yeah, the next time when you order something big size, try to contact the seller and ask for small packaging as much as possible. Thanks Nell for the heads up! Never knew that. I guess over time the forwarders wise up and emulate the way their US counterpart make money. When buying a large item it may be better to ship via sea freight. The easiest way to do this is to use 65daigou (you don’t have to ship a cubic metre of stuff which is the minimum requirement if you were to organize your own sea freight shipment). They use volumetric weight too but the shipping rate is slightly lower. hi, new user of taobao here. just wanna ask people who used DPX before. what if there’s no one to receive the items on the day it was sent to your door step? i know 4PX will drop items at the POP station but what about DEX? Sorry, no experience with that. Maybe you can report what happens if it happens to you ? hi. any body here knows the address of DPEX warehouse in Shenzhen? Hi Yen Kai, I hope I saw this blog post before I ordered from Taobao. I initially chose DPEX because I knew this is an old company with at least a few years of history, the service of which I had used before a few times. It was first known as DPEX, then changed its name to Toll Express, before changing its name back to DPEX. But this time, it was simply disappointing. Firstly, the warehouse in China was unable to explain to me why the status was not updated for about 2 days. The status on Taobao that the parcel left the warehouse appeared on 8 March, but there was no news until 11 March, when I finally was able to see the status update on the DPEX tracking page. The delivery man called me at about 1:30pm that day when he was already at my place, but I was not in and he promised me to deliver the parcel again after 4pm that day. But he didn’t come, and refused to answer my calls and reply my SMSes. Called the customer service hotline and was told that first failed delivery attempt will not have redelivery one the same day, but I would receive a SMS with a weblink to ask me to reschedule my delivery, which I didn’t receive at all. I called again on Saturday morning (12 March) at 8:30am and another customer service staff said she didn’t know where the parcel was and redelivery on the same day was not possible. I got angry and raised my voice and she finally agreed to check the warehouse and call me back, when she told me that the parcel would arrive before 1pm. The uncle who did the redelivery told me that the guy who did the first delivery was just a contractor. Throughout the delivery process I didn’t receive any SMS from DPEX informing me of the status of delivery and why couldn’t the delivery men call first to check when the customer would be in? I don’t mind contacting them beforehand when the parcel just arrives in Singapore to schedule a suitable time for delivery, but their tracking system is so jialat that there was no news of the parcel on the DPEX website at all, until 11 March in the morning. Lousy courier company. Only use DPEX if you want to train your patience. Hi Samuel, sorry to hear about your experience, and thanks for sharing it here, it is very helpful to the other visitors to this page (and there are many). Looks like DPEX hasn’t improved their service enough, sad. SingPost hasn’t let me down once. I might try the other two couriers also since they look cheaper. I’m guessing that a luggage is likely not within the stated limit, so maybe you don’t have a choice. Actually there is another way of shipping that i have not discussed on my website before, which is the cubic metre type sea freight shipment, which tends to be the cheapest especially for bulky items. I just did a quick search, they now even allow breaking down into 0.1 cubic metre quantums, which will probably work well in your case. Just for your reference, check out this brochure http://pic.sgchinese.net/attachments/forum/201603/22/142328pqbkkpcdpd3ypcdz.jpg Note that i am just providing this as a reference and i am not endorsing this company in anyway, because i don’t even know them before. Tldr version: DPEX, NEVER AGAIN. Like many others commenting, I really wished I read this post + comments before choosing DPEX. While my bad experience isn’t due to unreliable delivery or having the packaging stripped, seeing all these comments would have made me think twice. For the sake of saving a measly 3rmb per 500g, I got shafted. They gave me 2 decimal place weighing for 2 of my major items and indeed I paid dearly for the “work” done. Item 1: I checked online retailers before purchasing and they were listed at 400g. Bought 2 and I figured with the outer box + some cushioning materials it would clock in at 1.5kg give or take. To my surprise, DPEX weighed it at 2.67kg. Contacted the seller to reconfirm the weight but he wasn’t too sure so I let it slide. Item 2: Now, this is the fun one. The item by itself is 300g. I told the (different) seller to pack it extra securely because it’s quite important. When it arrived at the warehouse…dun dun dun, they weighed it at 5.6kg. There was absolutely NO WAY it could have been that heavy. Again I contacted the seller to check. He didn’t have pics but was adamant it could not have been practically 6kg. Tried contacting DPEX to have it re-measured (seller’s advice) but they were unresponsive. Didn’t want to incur their wrath and have item1 and a handful other small items damaged or conveniently “left behind” so I requested for item2 to be returned to seller. They charged me the 5.6kg weight for the item to be sent back lol. Item2 arrived back at seller’s place and he took pics of unboxing to show whats inside (lots of bubble wrap and some scrunched up newspaper) + pics of item on the scale. It was only 1.5kg. Fast forward: Consolidated package (sans item2) arrived at my place. No problems with the delivery people. I measured item1, box and all…and it only weighed 1kg. And THEY charged me for 2.6kg. Phone case was an extra 200g. Various other small items was rounded up like you’ve mentioned. Don’t know what I did to deserve this super short end of the stick but lesson learnt. More research next time, and DPEX, never again. Sorry to hear about your experience. I guess just tweaking the weight a little, they make a lot more money, and you’re completely at their mercy. I would suggest using global direct (it’s still DPEX but they can’t anyhow quote), or a third party shipper. For my last taobao order , Singapore delivery is deliver by 4 px , not singpost. No sms was send on the day of delivery. Notice slip was also not issue when not successful. You cannot collect from the post office the next day..
You have to wait for 4px to send you contact number to make arrangement for re-deliver. There is no local contact for 4px. Hi Kim, sad to hear this is the case with 4px now, and thanks for letting us know! 4px has assigned the delivery to Airpak. You need contact Taobao online customer service to get the contact number. A better choice would be collect from singpost popstation as what you suggested .. Thanks..
Hello, may I know if you have tried PRouter or DEX? PRouter(Local courier: PRT Express) and DEX(Simply express) are offering the first kg at around CNY27-28, which is way cheaper than 4PX (I have been using 4PX). However, I’m a little skeptical after reading the comments on DPEX giving wrong measurements for the item’s weight. I do want to know if PRouter and DEX are trustable as it could possibly save me a few dollars. Thanks! If you’re not in a hurry to get your parcel, my honest opinion is that it may be still worth trying either one of them, for the savings at least. I see. Thanks for the review! Was just checking with 4px customer service earlier (via online chat). She told me that if the volumetric weight is more than 3 times of the actual weight, they will calculate the shipping charges based on the volumetric weight. Hope this helps! Hi Ivy, just noticed your comment. Thanks for that very useful piece of information! hello! i ordered my taobao things using ZTO and the taobao app indicated that my delivery was not successful because i was not home but the actual fact is i was home and there was no notification sent to me that delivery would be made prior. now i have no idea how to contact any delivery man because there is no notification slip either. who should i find??? Hi Jess, my guess is that you’ll just have to wait for them to deliver again. Hi Seng, thanks for sharing your experience with us! Good thing you still got your goods on the day you scheduled for. If you ask me, I would say that is already not too bad. The delivery people employed to do the job are expectedly lowly paid people who may not be the brightest to handle the job (I don’t mean to look down), and they probably have too many deliveries to do. Anyway, based on the comments left on this page, 4PX/SingPost is probably still the best, and most expensive choice, so far. Need ur assistance on this. Bought a pdt and has been delived to spore warehse. Now is awaiting to be delivered to my spore hse. Howvever the shipping rates are way too expensive and i regretting it. Is there any ways i can avoid payi g the exorbitant delivery price from spore ware shipping to my hse!? Say like self collect or the worst case ask for a re fund? Hi Dave, not too sure which delivery service you used for your Taobao purchase. I presume it is not Taobao consolidated shipment since the Singapore delivery to house would usually have been included in the fee you paid. Is it ezbuy or some other 3rd party parcel forwarder? If so, I think it’s possible to call them to arrange for self collection. I have personally self collected from ezbuy warehouse. Anyway, usually the delivery fee from Singapore warehouse to your home is not that expensive compared to the shipping fee from China to Singapore, but yes, I prefer to avoid paying that fee too. Stay away from DPEX… I shipped some media converter which is not illegal but they refuse to ship!! My parcel basically bounced around their departments as seen in my tracking. I paid them and asked them to sent to another forwarder and it takes another week just sitting in their warehouse. When asked, they say they are inspecting the contents before shipping!!! After another week, it reached my trusted forwarder and reached Malaysia in 4 days with zero issue…. Hi ZH, sounds bad, also amazed that you managed to arrange to get your parcel through another forwarder! Wondering if anyone has ever met with a major weight discrepancy for consolidated shipping before? I used Ninja Van – but I’m not sure who actually does the consolidation process for them? The two dog beds I ordered are around 4 kg and the shipping measurements are 80x65x30cm – but the shipping page shows it as being 16.6kg… How do I get help for something like that? Hi Beepers, I’m not too sure about the shipping rates for Ninja Van, you’ll need to find out how they calculate their volumetric weight. It could be something like height x length x width / 5000. I doubt they go by actual weight. Update 3 Feb 2017 – this is embarassing.. didn’t notice that Ninja Van is actually now one of the local couriers handling the delivery, probably since long ago. To answer the question, the weight is determined by the China courier (Dexi), and by right, it should be actual weight, but it is not specifically mentioned on Taobao website that it is by actual weight.